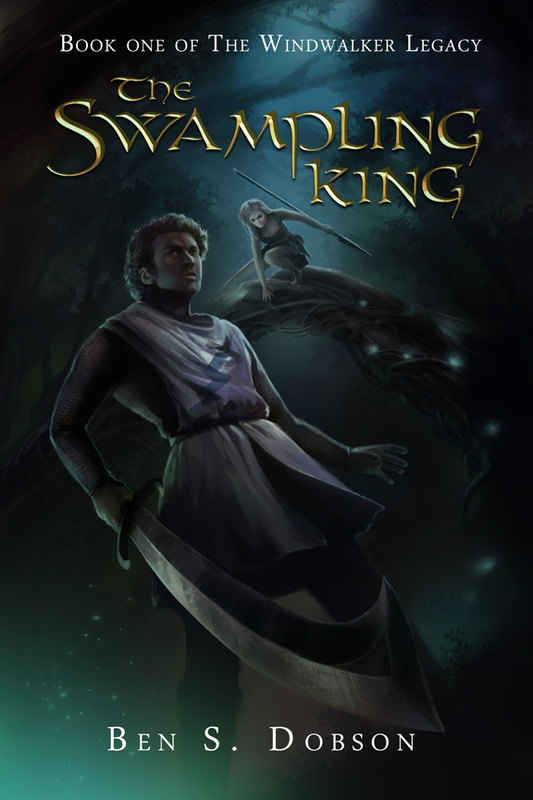 On this, the 21st of December, 2016, I have finished the primary writing of the Swampling King. It was a long time coming, years more than I expected, and a hundred thousand plus extra words, but it’s done. There is still editing to do, and that will take some time, but I expect to release very early in the new year. Not much else to say about it except Oh My God It’s DONE, I can’t believe it’s done, praise the sweet lord baby Santa Claus it’s done! I posted the same thing on Facebook, but I’m insanely close to finished, midway through writing the big finale. In celebration, here’s a little excerpt I posted there. It gives some information on what one of the Deeplings–the monsters of the piece–looks like, and the general unpleasantness of being near it. I was approached by a nice fellow who goes by “Mandrake”, from NameSake Radio (www.namesakeradio.com) about him using my short story the Last Hero in their Halloween show, and I said yes because that sounded cool, and now it is happening. The show starts earlier in the afternoon, but the dramatized reading of my story is scheduled for 7 CST/5 PST. Check out the link above if you want to have a listen, they are doing some other stuff too, such as a “music opera of War of the Worlds” to open the program, which seems pretty neat. I know I’m excited to hear it, I hope some other folks give it a listen too! I’m closing in on the end of the Swampling King at long last. There’s about ten more chapters to write, maybe a few more or less depending on where I put chapter breaks in the end. I’m moving along at a good speed too, since it’s all endgame exciting stuff that has a lot of momentum and tends to write faster for me. Currently I’m doing about a chapter a week, if I don’t run into interruptions, so I should be done writing before the end of the year. That’ll give me time to edit and hopefully release by Christmas, which would be a solid present for myself, I think. No firm release date yet, because I don’t want to break any promises when I get kidnapped for three months or something, but it’s getting real close. 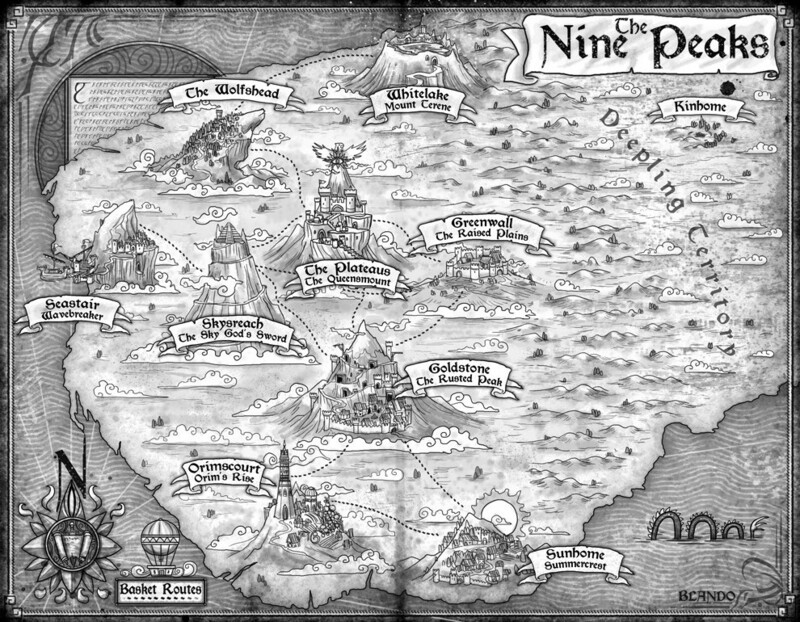 I am thrilled to present the map of the Nine Peaks, done by the incredible Jared Blando of theredepic.com. The Nine Peaks is a kingdom of nine cities on nine mountains, raised above the endless Swamp by the Windwalkers centuries ago. This map showcases a few of the details that distinguish each duchy in the Peaks: the many levels leading up to the Godspire in the Plateaus, the sprawling vineyards beneath Orim’s Tower in Orimscourt, the frozen alpine basin of Whitelake, and more. From these mountain cities, the Knights of the Storm wage an endless war against the Swamp-dwellers in the name of their Sky-God. The people of the Peaks are firm in the belief that destroying the Swamplings will end the attacks of the savage abominations that creep out of the mist at night: the Deeplings, monsters born of the rot and foul things that crawl deep beneath the earth. Beneath the duchies, impenetrable mist and thick tree cover shroud the Swamp in eternal darkness. Bands of semi-nomadic Swamplings hunt wildlife and collect fresh water in the shadow of the mountains to bring back to their Kinhome in the barren east–a haven safe from the merciless purges of the mountain people they know as “highlanders”. But there are other dangers east of the Nine Peaks: the Deeplings are plentiful there, and they are always looking for prey. The deepcraft practiced by some few of the Swamplings holds them at bay for now–but perhaps not forever. Well, that description got away from me a bit, but there you have it: an overly dramatic explanation of the world of the Windwalker Legacy. Imagine it in movie-trailer voice. I hope you enjoy the map as much as I do! Blam, a cover. Insanely awesome, I know. My thanks to the very talented Janette Ramos for her amazing work. And to further celebrate, click here for a new excerpt from the book. And for the sake of completeness, here are excerpts one and two, posted previously.